Start your trip to Freiburg, 01, Germany | Travel Expressions Ltd.
Freiburg im Breisgau is a city in Baden-Württemberg, Germany. Located in the extreme south-west of the country, Freiburg straddles the Dreisam river, at the foot of the Schlossberg. Historically, the city has acted as the hub of the Breisgau region on the western edge of the Black Forest in the Upper Rhine Plain. 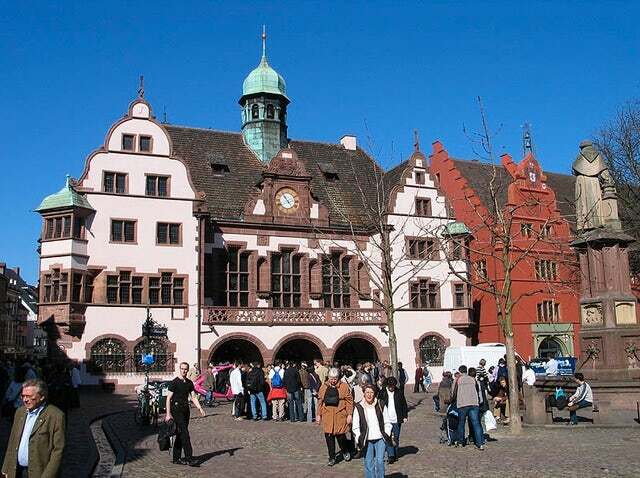 One of the famous old German university towns, and archiepiscopal seat, Freiburg was incorporated in the early 12th century and developed into a major commercial, intellectual, and ecclesiastical centre of the upper Rhine region. The city is known for its ancient university and its medieval minster, as well as for its high standard of living and advanced environmental practices. The city is situated in the heart of a major wine-growing region and serves as the primary tourist entry point to the scenic beauty of the Black Forest. According to meteorological statistics, the city is the sunniest and warmest in Germany.